EXPERIENCE THE EVOLUTION IN EQUINE THERAPY! Why China is the right market for your business? - From 2017 to 2018, 926 new equestrian clubs were opened across China bringing the total to 1,992. The CHF team know them all! - The average annual growth rate of equestrian club memberships in China is 68%, reaching just under 1 million members by the end of 2017. At its current rate of growth, club membership will surpass many European countries in just a few years and with no signs of slowing! - 20,416 horses were purchased by Chinese equestrian clubs in 2017 and this is projected to grow year on year. - 63% of horses owned by Chinese equestrian clubs are imported from overseas. - The market is not only growing strongly but standards across the industry are also improving rapidly. Riding club owner/operators and their members are demanding the best products and services as they look to achieve international standards in all aspects of performance and care. Welcome to the most important trade event for China's professional horse sports and leisure industries! Such an important market deserves a top-quality trade show and the China Horse Fair has fulfilled that role for more than 10 years. Since its launch in 2007 the China Horse Fair (CHF) has grown and developed alongside the country’s professional horse sports and leisure industry which it so successfully serves. CHF 2019 will be the 13th edition and will once again be China’s largest, most established and most international gathering for trade professionals and enthusiasts involved in all forms of equine sports and leisure activities. In 2018 the CHF once again hosted some 150 suppliers from around the world including Australia, Belgium, UK, France, Germany, Holland, Poland, Ireland, Italy, Russia, United States, South America, South Korea, Scandinavia, Singapore and China. Many new to market companies came to sell their latest products and services alongside established and successful brands who make sure they exhibit every year so as to meet new customers and boost sales. In just three days companies can promote their products to the top professional buyers and specifiers across the length and breadth of China, ensuring CHF is a uniquely cost-effective direct sales and marketing platform. With over 2,100 buyers, specifiers and influencers attending the 2018 event, CHF again strengthened its position as China’s No.1 professional equine gathering. CHF 2019 will take place in Beijing, Equuleus International Riding Club, in September 2019. CHF is a great event. We built connections with many decision makers in the horse industry through face-to-face conversations with them at the CHF 2018. We like the “Exhibition + Forum + Outdoor Practical Class” organised at this year’s show. Shijiazhuang Ma Yuexin Trading Co., Ltd.
CHF is the best trade platform for the horse industry in China. 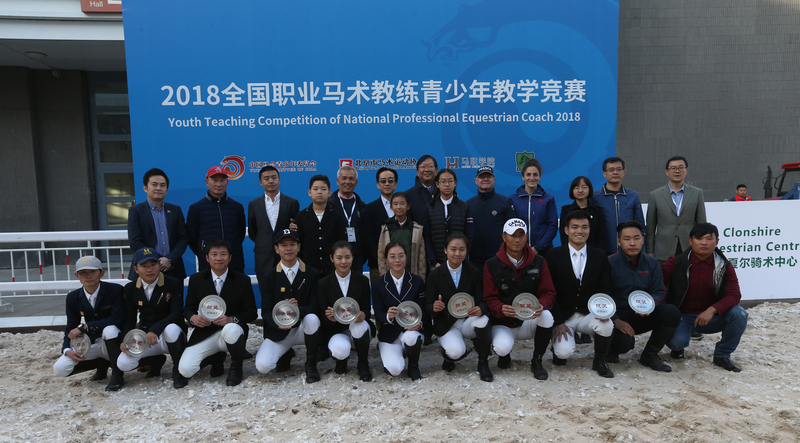 By attending CHF 2018, we met distributers and equestrian clubs all over China, including Beijing and Northeast China which are the country’s hot spot equestrian centers. We displayed many products, including horse nourishment and stable bricks at the CHF 2018. We believe that Chinese horse industry has a bright future. We have exhibited at the CHF since the first session. In the passed 12 years, we have seen the continuous development of the Chinese equestrian industry. The forum and activities under the theme of young riders are the main focus of CHF 2018, which we feel are interesting and the right features to be included. We believe that the young rider market in China will keep developing in the future. All of our harnesses are hand-made and many visitors may have never seen such a traditional hand-made harness- Horqin traditional harnesses. We hope that more people will know and understand the Chinese traditional skills through CHF. Inner Mongolia Huading Horse Industry Co., Ltd. This is my sixth time to attend CHF in China. In the past six years, I have made many Chinese friends and partners at the exhibition. I believe that the horse industry will keep developing in China in the future. CHF is the main annual event in China’s horse industry calendar. We participate and benefit from it every year. CHF has been successfully organised for 12 years. It witnesses and promotes the development of the Chinese horse industry. CHF 2018 has successfully grasped the hot spot of the industry at this time �C the young rider market. We hope CHF can keep pace with the times and become better and better in the future! As always, CHF is a festival of learning and communication for the entire equestrian industry. This is the second time for us to visit it. We wish CHF will be more success in the future! CHF 2018 displayed new innovations. We noticed that foreign exhibitors brought a lot of new products and technologies, which provided the local equestrian clubs with a good opportunity to see and learn. Additionally, through one-to-one teaching by Ireland coaches, our young riders become more confident after having these classes. Copyright © 2005-2019 HopeTarsus plc. All right reserved.